Making soft chapathis is an art. My MIL is an expert in making soft chapathis. I am not there yet. So this recipe is from my MIL. 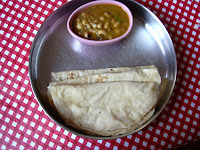 Here is the recipe for making chapathi. First add salt to wheat flour. Add water gradually and mix the flour to make a soft dough. Apply oil on top of the dough and cover it and keep it aside for an hour. Make the dough into small balls. Spread the dough into circles (choose the size. I make small chapatis, my MIL makes big ones). 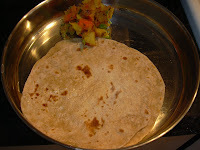 Cook the chapatis on hot tava. Flip it when one side is half cooked. Spread a teaspoon of ghee (optional) on top of it and enjoy it with a good bhaji.